I am convinced that man was created itself from the ground up and by nature to a peaceful coexistence with all creatures. God in whatever form we worship him, could not have had an alternative vision to the Paradise – the Kingdom of Peace with the rule of the all-embracing love. Therefore I expect of religions and their beliefs to develop global peaceful exchange and an inter-religious consensus. The Task of religion is to connect people with God and to remind him of his immortality. In this task, they have to promote the love to all creatures peaceful and harmonious and shall undertake political, economic and scientific cooperation in this matter. We all have the same Creator of this universe created in perfection. Our responsibility as humanity is to advance the peace with the religions and politics. There is ultimately no alternative, truly and significantly shown by atomic weapons and the information technology. We also have a duty to our planet and the whole universe to take care of and not exploit and destroy it. Therefore, a sustainable global economy and a global truth committed science has to promote and protect all living things and guarantee them a fair living basis. It is thus not a religion or form of government, economic system or science to be tolerated on our planet, which disregards these principles. This means that States have to demand from religions the fulfilling of its peacekeeping role as much as they have to enforce from economy sustainability. Religions themselves have to undertake together with the sciences the countries and religions to their task. There was and is still an elite that has just carried out those tasks. The Rabbis and Kabbalists, the Sufis, the Gnostics, the Essenes, the Yogis, the Mystics, the Seers, the Visionaries of all disciplines, the Geniuses, the Child Prodigies, the Wisemen, the Teachers of Humanity. It is to rewrite the story based on these peaceful leaders. Among all the examples, there were few in the last thousands of years, who are good examples without fault and blame. Let us take the best and build a new peaceful world by all of us, every person as an individual and by professing all of us together with the peaceful principles which most holy books and writings have unanimously named. This is my contribution to a peaceful understanding between all religions and sciences, and all kind of politics and economy. 1st – The two towers of the World Trade Center, World Trade Tower 1 & 2, were neither blown up nor caused to collapse by fire; they were both „pulverized and blown away“ about an hour after the first explosions with burning large fire and correspondingly large clouds of black smoke in a manner for which we have no explanation. Just watch the videos! Southern Manhattan was covered by a cloud of powdered concrete, steel and asbestos that fell down like thick snow. This can be seen by every objective observer of these videos. There was no appreciable debris at the „Ground Zero“ collapse point. The garages below the „collapse site“ are said to have remained undamaged and have not filled with rubble. If all the debris from both towers had actually landed on the ground, the „Bathtub“, the water reservoir, at the old New York City Subway underground station would have been filled with debris, the walls of which would most likely have burst and the pool flooded with water from the Hudson River. Moreover: No fire brigade in the world would go into a collapsing building to save people, because there is nothing more to help. We know pictures of skyscrapers burning for days without collapsing! The fire brigade was completely convinced that the two towers could not collapse, regardless of whether aeroplanes were flying into the towers or the towers were burning. Consider the first „Islamic terrorist attack“ with a urea nitrate bomb in the underground car park of the WTC North Tower in 1993. 2nd – The Twin Towers could not have been brought down by aeroplanes. The towers were built so that no plane could bring them down. Light-metal aircraft are physically unable to penetrate such a solidly constructed building. The outer shell of the World Trade Tower buildings consisted on each side every 100 cm of 59 pieces of 36cm x 36cm strong columns of »fire-protected specially solid steel of 6mm – 100mm thickness«, between 30 cm wide, 13 cm thick windows and in the middle of 47 core beams of 90 cm x 36 cm again of 6mm – 100mm thick fireproof steel. »http://www2.ae911truth.org/WTC1_blueprints.php« All airliners are made of aluminium and must be reinforced with frames to prevent them from breaking in the air. Every plane that hits hard surfaces shatters into a thousand pieces. We were shown films that let us assume that two aeroplanes flew into the two buildings and created a huge hole through exploding kerosene. The videos on which the aircraft appear are extremely short and do not show a clear impact situation; with modern analyses, the same images have been verified as retouched in. On one of these films, even the intact nose tip of the aeroplane on the other side of the building protrudes after the aeroplane has flown through the 47 core carrier steel columns without breaking, which is simply physically impossible. The width of the Boeing 767 with a wingspan of 47.6 m does not fit into the empty hole of 36 m at Tower 1, and no part of the aircraft protrudes from it, the hole is empty. The WTC was specially built to withstand the impact of a Boeing 737 aircraft. 3rd – World Trade Center No. 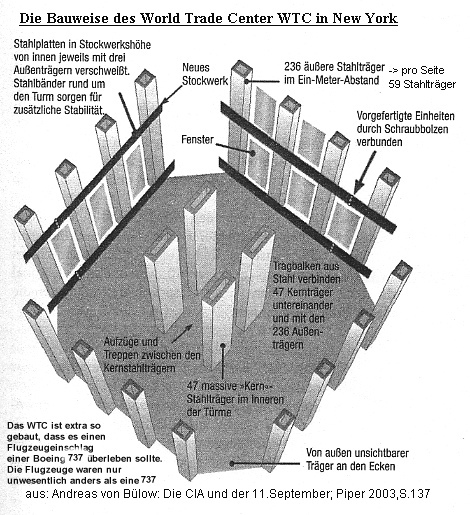 7, WTC7, must, according to all the technical knowledge of architects, structural engineers and blasters, have been brought to a subsequent collapse with special explosives (nano-thermites) in an extremely precisely planned action, since accidental fire development develops too little heat and under no circumstances can cause the building to collapse precisely within its own structure. Even on WTC7, all academics are advised, at the risk of their careers, neither to comment on it nor to research it and to question the official presentation of the events of 9/11. This makes it unnecessary to explain why the „condemnation“ of dissenters still works. These three points should be enough to show that we are being massively lied about this matter. Anyone who believes in the official version must be very naive or represent the political and financial interests of those who lie to us. „Thanks to the research of Russian scientists Arcady Petrov and Igor Arepjev that in the early stages of the research center in Noosfera / Russia, following in the research project SIGOR worked, as well as based on the work and findings of the Academy Member Grigory Petrovich Grabovoj succeeded in Russia to develop a unique methodology, which allows regenerating the health even when completely hopeless diagnoses and restore the organs and cells of humans. The formation of this knowledge is held in the Research Academy Petrov Arcady and offers the first step on the infinite ladder of the ’new knowledge‘ to the harmonious, happy, prosperous and eternal existence of mankind – the eternal fountain of youth. It says so in the dossier. The three-level training in the first stage offers the possibility to adapt the transfer of bioenergy technologies to bioinformative technologies. The second stage of training and ideological aspect of the doctrine is the study of Arkady Petrov „On the creation of a harmonious and creative world.“ Lectures on the history of creation, based on the trilogy of Arkady Petrov „creation of the world“ and its scientific and methodological work, „the tree of life“ – and others of his work on the beaten path of people who give us the opportunity to combine the physical and mental nature of man. Now straight from the creator was served down a new teaching level to the people, with the aim of stopping the seemingly impending global destruction of all humanity and creation on our planet. Therefore this doctrine for the new age is: „Rescue and harmonious development“. This theory assumes that the creation (God) in any faith, and in any culture in every man everywhere and uniformly exist. The connection to the Creator of man is his soul. For the first time, the knowledge about the structure of the soul and the structures, such as the external reality is created and can be changed, was given to man. P.S. In August 29-30/2010 I attended the seminar in Zurich by Svetlana Smirnova. You will find my report in the »3rd Newsletter 30.09.10« on this website. Like most children, I have always been fascinated by secrets. Miracles were nothing inexplicable to me, the explanation was not found easily. Similarly, as an adult, I remain convinced of the truthfulness of fairy tales and legends. The only miracle that I can testify to date with my physical eyes, I have seen in 1991 in Bangalore, India: Sai Baba has produced holy ash (Vibutti) in open space with open hands and a half-long-arm shirt. The most impressive magic I’ve seen presented in person at the Hallenstadion in Zurich by magician David Copperfield: Flying with a woman on his arm. The dream of flying is an ancient human dream and I was often in a dream having flight experiences. My enthusiasm was awakened early, my grandfather was an air observer in the military and knew many of our Swiss aviation pioneers personally. I grew up the first two years next to the military airport in Dübendorf and had later listened in the same place to our Swiss astronaut Claude Nicollier, as he told of his first space flight. The lunar landing of the Americans one of the greatest adventure of mankind, I have followed closely. Later I got the brochures at the travel agency Kuoni for a planned space flight, to date, this variant for masses has been achieved by anyone. Although so far as a tourist attraction too expensive and ecologically still nonsensical, would be the direct effect of a travel program that the passenger understood the preciousness of our planetary existence. „The Overview Effect“ is a book that demonstrates the positive impact of our new worldview statistically impressive. Equally fascinating, I find projects that are planning close to the ground flying objects. Between magic and real supernatural powers („siddhis“ in Sanskrit) I have mentioned the flight by means of magic from magician David Copperfield and the promises of the Transcendental Meditation (Yogic Flying) as are the stories of the Eastern Church on the Levitation of their holy church fathers and the stories from ancient India and China. At first, I was discouraged by literary criticism to read the books of Carlos Castaneda. But when I attended a seminar with Harley Swift Deer, a Cherokee half-breed (METI), had taken part, I realized that all these ceremonies work very well in a magical way as easily as our modern techniques. When I asked under the tree in all four directions my selected stone, the stone spoke to me about what needed to complete every aspect of my personality! Still remains unclear to me whether the fast displacements tricks of the magician (Nagual) Don Juan are due, or whether the visits took place in the fine or even with the gross body. According to my teachers, but anything is possible. Since this Seminar of American Natives, on the basis of the knowledge of the Hopi Tribe, I also know from experience that we do not know everything about our ancestors. Our modern science has an unjustified sense of superiority to old cultures. Our Western historiography neglected in Eurocentric arrogance all high cultures of the ancient world with the exception of the Greeks and Romans. Pyramids scattered in different continents, all placed on the equatorial belt of the solstice, testify to the closeness of the former civilizations that go back several thousand years. In China, India, Tibet, Egypt and America, there was all that we hold today in modern science a long time ago. Even in Europe, Celtic and Druidic science testify to the same origin. We only repeat the same mistakes again and again and we really learn about it? The phenomenon that the saint was not to eat and sometimes did not need to drink is handed down in many places. – Certificates of such events we find in »Therese of Konnersreuth« (1898 – 1962) in Wikipedia says: „She also since 1926 except one piece of »Communion« (a wafer) per day, neither ate nor drank every day.“ The same you find about our Swiss patron saint, »Nicholas of Flue« (1417 -1487): „Apparently he took in the last 19 years of his life except for the »Eucharist« (the Holy Communion/the Lords Supper) nothing to eat and drank only the fresh spring water from a nearby stream.“ Two examples of saints in the vicinity. As a new publication this way of life more ordinary people seems to manifest itself and a certain time a large number of people was guided from »Yashmuheen« (born 1957) in a so-called „21-day process“ (but today, she recommends a more lightweight version of these extreme experimental arrangements for everyone). A German chemist living in Switzerland, »Dr. Michael Werner« (born 1949) has the same process tested as self-experiment and describes it in his book. Publicly he declared on TV to live without food. Please take note that I am NOT recommending this experiment. I have tried this experiment on myself in October 2006 without any support and survived without damage (seven days not a drop of liquid drinking and from day 8 – to day 21 only diluted juices of orange (10 %) and no food all the 21 days). My weight has stabilized thereafter at a healthier level, but I felt no need to go on further and since then I eat and drink again with pleasure and joy. What remained is a more conscious approach to food and another reference to myself, but I consider it as irresponsible to advocate such a thing. There are people like me who try such a thing in personal responsibility, which I find acceptable, as long as they are no burden to anyone and know what they do. I even have my people and my closest loved ones exonerated from any responsibility in writing and I would stop this experiment immediately if I had felt any pain or problems with my body. Yashmuheen I met personally on two lectures and I never had the impression that she has something to hide. Her main concern is peace on this planet and spreading of love. As you yourself can read in the newspapers, such happening of wonders was and is of our society and science declared impossible, and torn by the media, only with saints and dead ones they are a little more cautious. »Therese of Konnersreuth« the German saint of the last century was checked three times for longer periods of weeks of integrity witnesses and confirmed. although our senses cannot deceive us.